The Battle of Antietam is often referred to as the bloodiest day in American history. As we walk around the battlefield now, it's hard to imagine that more than 23,000 soldiers were killed, wounded or missing after 12 hours of savage combat on that hot September day in 1862. The Battle of Antietam ended the Confederate Army of Northern Virginia's first invasion into the North and led Abraham Lincoln to issue the preliminary Emancipation Proclamation. I've written before about the Battle of Antietam, when we visited the annual Illumination in December, when a luminary is placed for every single one of those killed, wounded or missing soldiers. date from the Civil War; the wheels and carriages have been rebuilt. Seeing a battlefield from the perspective of the soldiers who fought on it -- ground level -- is, I think, the best way to see it, to understand it. 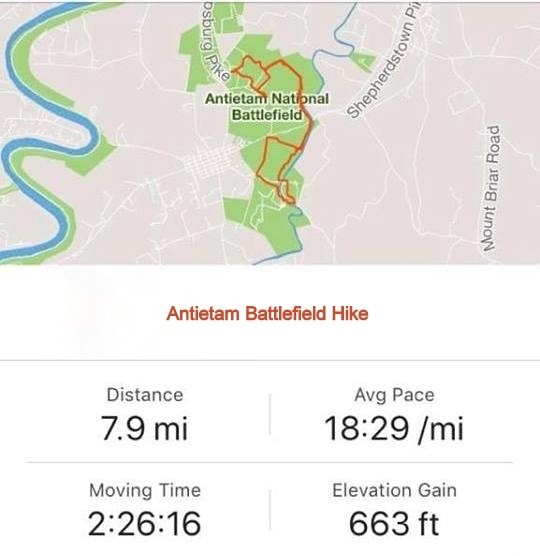 I finally walked Antietam! And it was a nice hike -- about 8 miles long, with a 600+ foot elevation gain. Although you can see a battlefield faster by car, walking is the best way to experience it. Starting from the Visitor Center, we walked across the field behind the visitor center toward the Sunken Road, which we followed toward the tower (which we climbed). Confederate soldiers had held the Sunken Road, where some of the most intense fighting of Antietam took place. The Sunken Road was a dirt farm lane at the time of the Civil War, used primarily by farmers to bypass the streets of Sharpsburg. The fighting was so horrific there, and so many died there, that after the battle, it became known as Bloody Lane. mounted on their muzzles in blocks of stone, mark the names and locations of the deaths. efforts by the military to create an open-air classroom at the battlefield. After climbing the tower and looking over the battlefields, we backtracked a bit on the Bloody Lane, turning right on the Bloody Lane Trail, following in reverse the footsteps of Union soldiers when they advanced toward Sunken Road. The Bloody Lane Trail led us to an intersection with Three Farms Trail, which would bring us to the southern end of the park. Connecting the north and south parts of the battlefield -- Bloody Lane to the north, Sherrick Farm Trail to the south -- the Three Farms Trail is one of the most peaceful parts of the park. We barely saw anyone on this part of the trail, just some very cute and curious cows. Yeah, I took photos of the cows! We followed the Three Farms Trail along Antietam Creek and through the woods, crossing below Boonsboro Pike, until we came to the Sherrick Farm Trail. We turned right onto the Sherrick Farm Trail, following it through the farm fields -- typical of Antietam -- to the parking lot for the Antietam National Cemetery. We then followed Rodman Avenue down to Sherrick Farm, crossing the overpass to Branch Avenue. The road took us past the Otto Farm, and eventually to Burnside Bridge. We crossed Burnside Bridge, pausing to admire the witness sycamore, which was but a sapling during the Civil War. At the Burnside Bridge, we picked up the Union Advance Trail, which we followed to Burnside Bridge Road. The upper reaches of the huge Burnside Witness Sycamore Tree, which now guards the Burnside Bridge. The Union Advance Trail explores the area where Confederates defended the Burnside Bridge, and where Union Ninth Corps advanced and tried to take the bridge. We walked along the road 50 yards or so, crossing the bridge over Antietam Creek. Just after the bridge, we turned right, back onto Sherrick Farm Trail, following that trail until it turned into Three Farms Trail again. Three Farms Trail took us back to Bloody Lane Trail, where we turned right into Roulette Farm, following the Bloody Lane Trail past o Farm up the hill to the Mumma Farm. After seeing the Mumma Farm, we followed the farm lane up to road, past the planted fields until the grass lawn below the Visitor Center, when we turned into the lawn, walking the rest of the way up the hill to the parking lot, ending our hike. Along the way, you'll learn about the battle, as there are frequent information signs, seeing the impossibility of what the Union troops were asked to do -- take the Sunken Road, fighting uphill against the superior position of the Confederate troops or taking Burnside Bridge, well defended by the Confederates. Most of the monuments are clustered along the park roads, but there are a few along the hike as well. Mostly, though, you'll see the historic houses and barns that stood witness to the terrible battle -- the Civil War took place all on private land, mostly farms, afterall. Old stone walls and fences line the hike, silent witness to the passage of the years. A summer kitchen on the Parks Farm. Know before you go: If you're going hiking, go prepared for the weather. Bring water, bug spray, hats, wear appropriate shoes and clothing, etc. The trail as described is just shy of 8 miles long, with an elevation gain of just over 600 feet. Hours: The Visitor Center is open daily from 9 a.m. to 5 p.m.; park grounds are open daylight hours. Closed Thanksgiving, Christmas, and New Years Day.